"Verbatim" was established in the United States in 1969,"Verbatim" logo are the trademarks. Verbatim pay high attention to product detail,quality and stylish. We try our best to supply customer most satisfied product. 100% Brand New Universal Travel Power Adapterr for italy france thailand spain austria south africa japan uk india ireland israel asin europe . Input: 100~240Vac 50/60Hz 0.9A Max. USB3.1 PD Output: 20V/0.8A Max. QC3.0 /2.0 Output: 9V/2A Max. 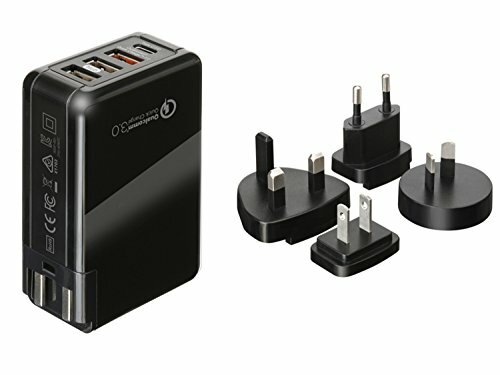 1:This high quality travel adapter was made of Verbatim company. 2: When you prepare to place an order,please check your color and other purchase information of this worldwide adapter ,thanks a lot ! 3:If you do not know how to use this multi port power adapter or any other questions,kindly feel free to contact us! 4:This International Adapter is Sold by Topsa. Only Buy from Topsa to Get High Quality Products with Quality Warranty and Customer Service. Method 1:Click on "Topsa" next to "Sold by", then click on "Ask a question"on the right top of page. Method 2:If you ordered from us,sign in your Amazon account Choose "Your Orders" Find that order IDClick "Contact seller".